We’re really excited to be throwing open the doors to our new studio in Lichfield and showcasing some of our new interactive products, using augmented and virtual reality. Interested in knowing more and see how the White Crow team can help produce interactive and engaging marketing products, then why not join us! The Nest, 7a Bore Street, Lichfield, Staffordshire, WS13 6LZ. 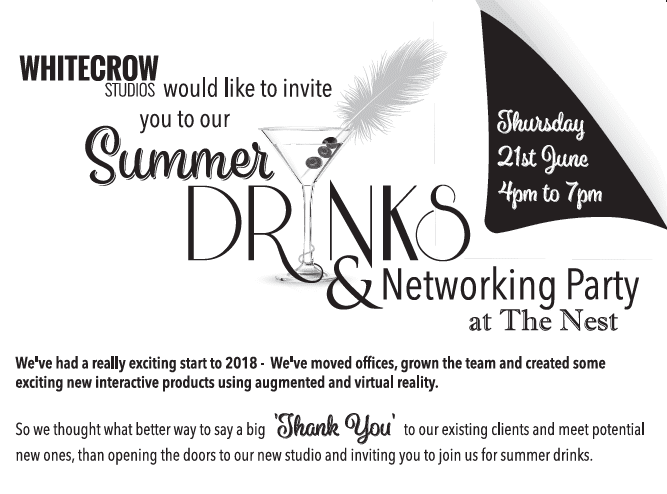 Register your space today thenest@whitecrowstudios.co.uk and join us for drink, nibbles, networking and much more!